Timer apps tend to assume we only have one thing to do (or time) at once, yet, for us at least, that’s often not true. If, like us, you want to be able to set multiple timers at once, Multi Timer StopWatch could be for you. It’s not unique in allowing this, but it does seem to be in the minority, and it also does a whole lot more to help it stand out above the rest. Among other things it lets you save multiple timers too, which we’ve found far more useful than it sounds. So, if for example you regularly exercise for a set amount of time, or run the washing machine for the same duration, you can have permanent named timers for each of these activities. You can also give each timer a custom sound, and add widgets to your home screen for even easier access. Plus, you can have timers within timers, allowing you to sound an alert after a certain duration prior to the timer coming to an end. 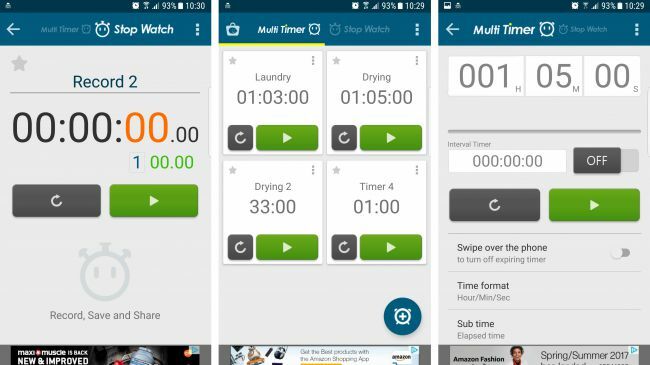 As the name suggests, Multi Timer StopWatch also has a stopwatch component, and there are all sorts of other things you can tweak and configure, such as the layout of the app itself and whether to show individual notifications for each active timer, or just a notification for the next one that’s going to go off. The app’s more functional than stylish, and if you don’t want to see adverts across the bottom you will have to pay $2.99/£2.79 to get rid of them (a fee which also unlocks a dark theme), but otherwise you get the whole app for the generous price of zero dollars.